That’s right. According to Biderman, the money did not come from (a) companies (“which were a huge net seller”) (b) retail investor funds, (c) retail investors, (d) foreign investors, or (e) pension funds. “The Working Group on Financial Markets, also know as the Plunge Protection Team, was created by Ronald Reagan to prevent a repeat of the Wall Street meltdown of October 1987. Its members include the Secretary of the Treasury, the Chairman of the Federal Reserve, the Chairman of the SEC and the Chairman of the Commodity Futures Trading Commission. Recently, (2007) the team has been put on high alert because of increased market volatility and, what Hank Paulson calls, the systemic risk posed by hedge funds and derivatives…. This suggests that the PPT could, in fact, be the driving-force behind the ongoing stock market rally. True. The market has been behaving erratically for some time now. 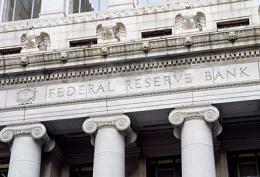 Could it be the “invisible hand” of Fed chair Ben Bernanke nudging equities ever-higher? If there was ever a time that warranted government intervention, it was right after Lehman Bros blew up and global markets went into freefall. The whole system was teetering and about to collapse. It’s likely that the Fed recognized the danger and made a last-ditch effort to avoid another Great Depression. That means that Bernanke probably used his surrogates at the banks and brokerages to strategically purchase futures and equities that had the best chance of reversing the downward trend. What else could he do—sit on his hands and wait for Armageddon? The problem is, no steps have been taken to prevent a similar catastrophe from occurring in the future. The same lethal debt-instruments that triggered the crisis are in play today; over $1 trillion in toxic assets still remain on the banks balance sheets, and nothing has been done to reduce financial sector debt. In fact, according to the Fed, total debt for the financial sector was $16.5 trillion in the second quarter 2009, the same as it was a year earlier. Nothing has changed. Financial institutions are re-levering and taking on greater risks knowing that the government will bail them out if they get into trouble. At the same time, the Fed’s lending programs have kept markets from fully-correcting by keeping asset prices artificially high. This has helped the banks to conceal their losses and appear healthier than they really are. The question is; how long can the charade go on before something gives? Policymakers seem to believe that blanket government guarantees and stock market manipulation are enough to forestall another disaster. But critics think that a day of reckoning is fast approaching.